Imagine this: You are sitting in the Bistro P. having a glass of red. You are at one of the wooden tables along the wall. You look around. There are perhaps a dozen people left and they are all sitting at wooden tables. You smile. All the tables are wooden. Perhaps, it is after midnight. You’re not sure what time it is. You’re alone at the Bistro. You are often alone at the Bistro. Marc Chagall comes in and sits at your table, across from you. Inexplicably, even though you have never seen his picture, you know who he is. “Are you Russian?” Chagall says. “Find out about you people,” he says. He orders a bottle of expensive French wine and you wonder who’s going to pay for it since Chagall died in 1985. You hand him your Waterman fountain pen – the one you can’t seem to lose. You help him down from the chair, he orders another bottle of wine, and you don’t care. 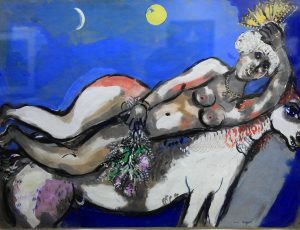 The waiter pours the wine and you sit with Chagall and watch the falling snow, which is, of course, filled with starlight. At around 2:30 a.m., a red donkey walks down the middle of the street and you both watch it without flinching, or saying a word.